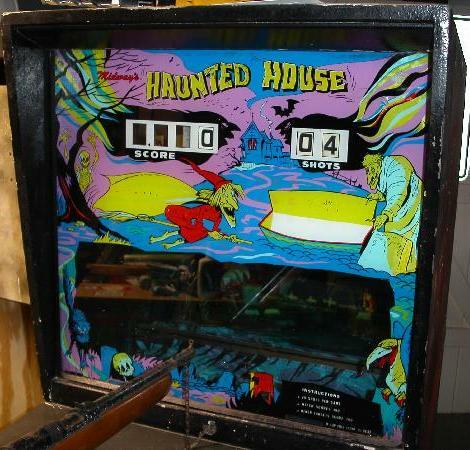 Description: Haunted House, Midway #553, 1/72, gun game with two cats, a witch, and a grave robbing monster. 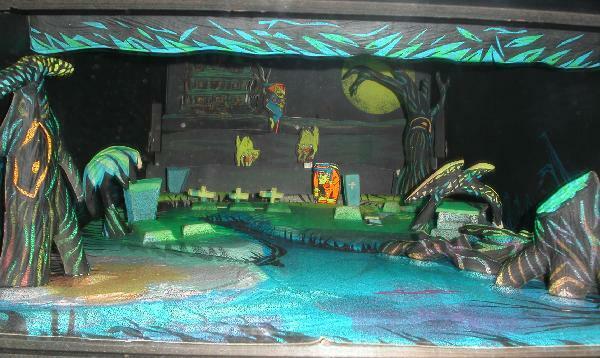 Blacklight lighting, 8-track player sound loop 2 minutes 42 seconds long, uses a special 4-channel 8-track player (one track is used for background "spooky" sounds, and three other tracks have sound effects for specific targets - the monster, the cats and the witch). 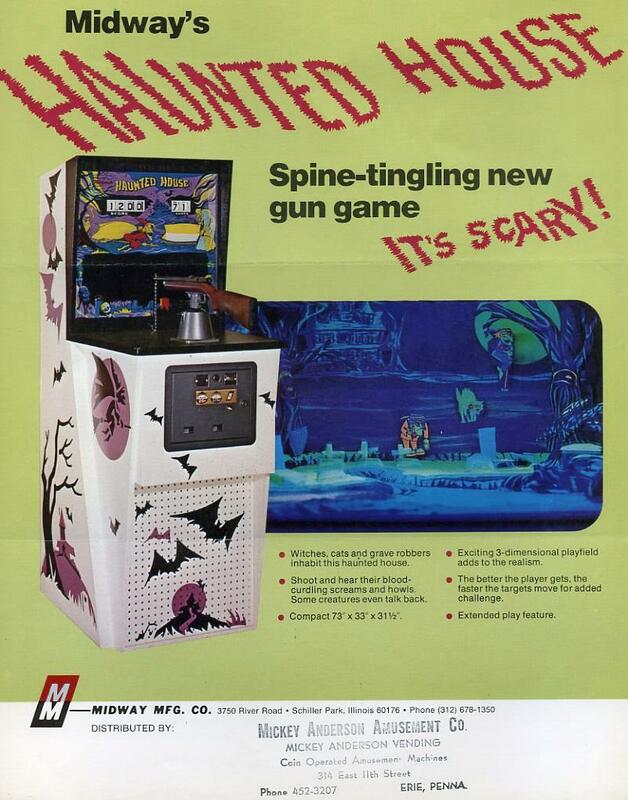 Gun has recoil and there are two circuit boards in the back of the game for amplification and motor speed control. The target motor speed increases at 1000, 2000 and 3000 point levels making them harder to hit. Game gives 20 shots with unlimited time. If a certain score is reached, 10 more shots are awarded. 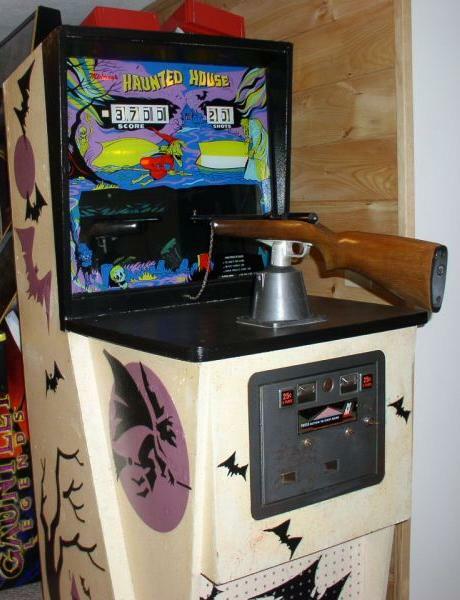 Haunted House's theme is a good one, and the sound affects are very good, but it's not that great of a target shooting game. The biggest selling point of the game is the theme and the sounds. 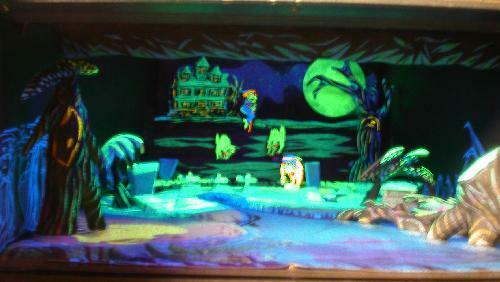 The background 8-track sound plays continually, but the tape skips to one of the other four tracks momentarily (haulting the background sound) for the appropriate target hit. I find the track jumping to be a bit clunky. 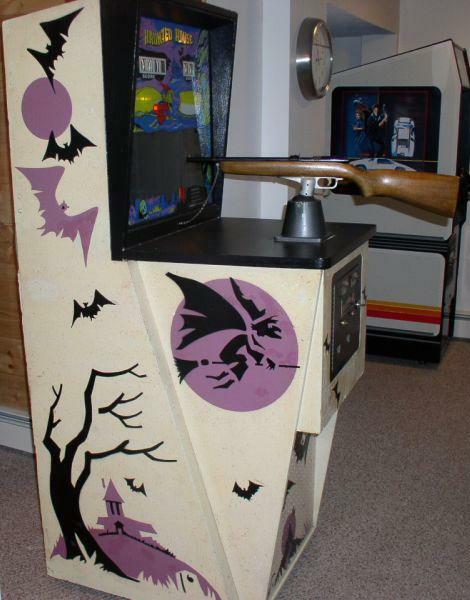 I personally like Wild Kingdom more if you are into Midway gun games with 8-track sound (but this is still a fun game.) Note flyer size specifications wrong (26" wide 35" deep is correct).